World on Stage and UAU International are extremely proud to be returning this world class production to the UK direct from Las Vegas and the rest of the world. Returning to St George’s Hall, Bradford on Tuesday 22 March. 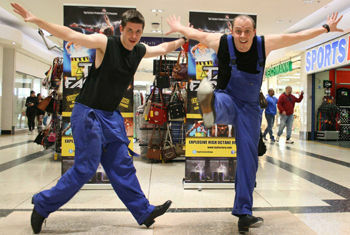 Tap Factory will amaze and delight the audience, using many genres of dance in a contemporary urban setting. This dynamic work created by Vincent Pausanias features the world’s best Tap Dancers and international musicians blending the art of dance, percussion, comedy, and acrobatics. Choreographer and Artistic Director Vincent Pausanias wanted to create a show that would showcase the magic of tap at its highest possible technical level using world renowned tappers. He brought together Gilles Guenat, World Champion of Tap (elite category) and Jeremie Champagne, finalist of So You Think You Can Dance, France. Vincent also used his large experience as a director of many different shows to introduce other disciplines such as Urban percussion, acrobatics, Hip hop and comedy, to bring Tap Factory to another dimension. The fusion between all the artists creates a unique show where amazing performances, exciting rhythms, energy and poetry are joining together with a great sense of comedy and humor.